HOLLYWOOD MOMS – Traffic Alert ROAD CLOSURE on Hollywood Blvd. TODAY! You are here:Home-Events, Parents of Child Actors, THE BUZZ-HOLLYWOOD MOMS – Traffic Alert ROAD CLOSURE on Hollywood Blvd. TODAY! A great resource for Hollywood Moms and Hollywood Dads regarding all things “audition traffic” is NavigateHollywood.com. 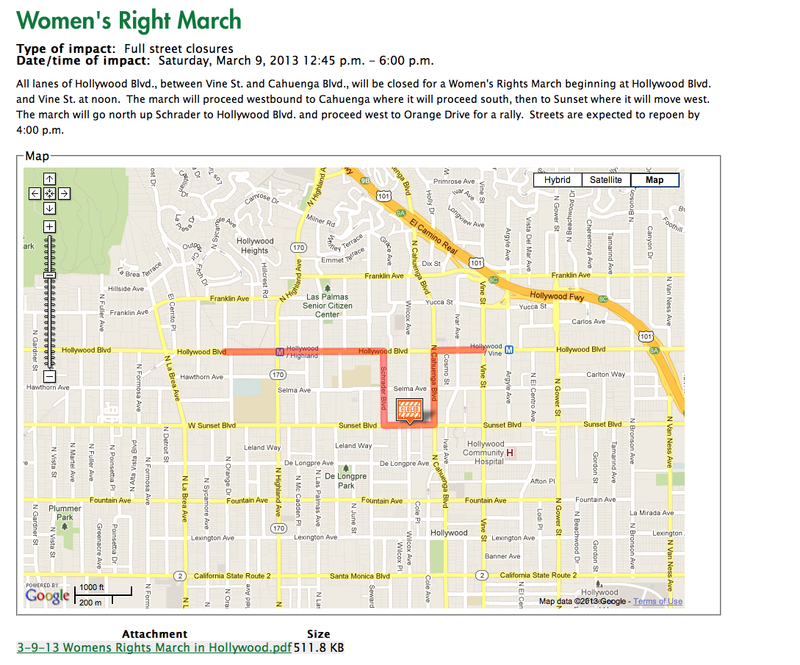 For instance, today the Women’s Right March will be occupying all lanes of Hollywood Blvd. from 12:45 p.m. until 6:00 p.m. tonight! That’s a lot of diverted traffic people. The boundaries of their traffic information are outlined here. Follow Navigate Hollywood on twitter for all the latest updates at @NavHollywood! Happy Driving and thank you to HM Lisa Pitts for bringing this to our attention! By Editor Tracy Bobbitt|2013-03-09T15:15:34-07:00March 9th, 2013|Categories: Events, Parents of Child Actors, THE BUZZ|Tags: Audition Traffic, Avoid Audition Traffic, CHILD ACTORS, Navigate Hollywood, parents of child actors, Where to park at auditions|Comments Off on HOLLYWOOD MOMS – Traffic Alert ROAD CLOSURE on Hollywood Blvd. TODAY!